Something similar is happening at the intersection of physical space and empathetic technology. As our concept of place evolves along with the physical walls that we inhabit, hugely positive changes are possible. I see a grand future where we become more deeply connected with the nuances of our bodies and develop trust in our physical spaces to make adjustments based on our physiological needs. Soon, we will have a personal relationship with our spaces. 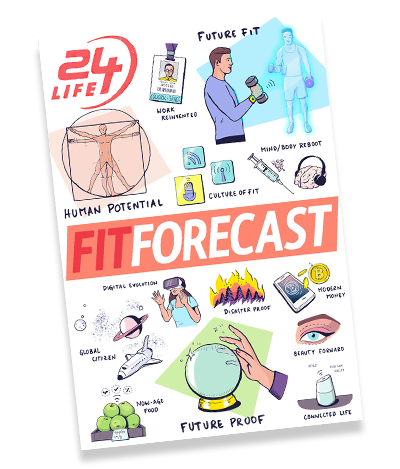 Sensors will be shifted away from our bodies to create physical places that benefit more than our fitness and enable us to interact—to train, work, focus and recover in them more naturally. Today, fitness trackers and data collectors are largely devices that we wear. We often talk about them as “wearable technology.” These sensors need to be strapped to our arms, feet, head and chest in order to generate vital information that we use to increase efficiencies in our workouts and training regimens or to optimize our peak performance through digitally scripted programs informed by our biometric data. Metrics from heart-rate analytics, blood oxygen levels and sleep patterns to the velocity of our body’s movements in its accelerations and decelerations all can inform our plan for reaching our goals. While we’ve gained transformative insight in determining how to better care for and improve our bodies’ capacity, it’s still work that’s quite manual and descriptive in nature. We—or an app—interpret the data and make decisions for ways to reach new targets or better optimize how we perform. Now, envision a near future where our personal and biometric signals are part of a dynamic interaction with our spaces as we’re in them. Spaces are active: They interpret our bodies’ responses and react dynamically to our internal states and physical movements. Our rooms are aligned with our goals in a relationship that helps us attain our mental and physical targets. Here, the dynamic interaction between our bodies and our spaces transforms how effectively and optimally we can perform across a broad range of efforts—physically and cognitively. In this future, sensors are not on us but, instead, embedded in the spaces around us. These sensors can pick up the same biometrics and personal data from our bodies as the wearable ones did—and much more. Our space becomes an interactive partner that helps us maintain and reach a new capacity mentally and physically, without having to wrap our physical bodies in more and more devices. We already have thermostats that can learn our behaviors and adjust the temperature around us based on what would be the most optimal, given our personal living patterns and times of day. We have intelligent lighting solutions that can fine-tune color output to improve focus for working hours and accelerate relaxation for winding down. The next leap in this evolution is what most inspires me. Soon, our spaces will become intelligent to us—to our myriad states and emotions. And they will respond. When technology is empathetic, it modifies its state by the response of our internal experiences. Our bodies’ biometrics and behaviors reveal how hard our brain is working, whether we are under stress or even what emotion we might be experiencing. A room with empathetic technology uses this information and intelligently adjusts parameters such as light, oxygen, temperature and even ambient noise to create a more desirable environment and better optimize our internal states. I recently spoke at TED about this very topic, demonstrating how current consumer sensors in our spaces and environments can combine with machine learning to read physical signals like thermal body temperature, mental effort, stress levels and our emotions (joy, fear, suspense, etc.) from signatures as simple as the chemical composition of our breath. We’re fast approaching a world where we’ve moved beyond being a monitoring station adorned with various sensors—all of which can detract from being able to move, feel and think in a natural way—to existing alongside rooms that adapt to us. Your thermal image is data. Your breathing patterns are data. Sensors integrated into our spaces will be able to sense critical changes—from chemical signatures to other things we radiate—and react to us. All this can be used to optimize our learning, our fitness and our expectations for how spaces can adapt and actually care for us. This requires a monumental shift of thought—much like the shift required to embrace the digital ride-summoning revolution—where we begin to respect the relationship between humans and spaces. These spaces will become partners, and by being sensitive to our changes and reacting accordingly, they’ll change the way we train as well as how we learn in them and with them. We don’t know exactly how responsive spaces will impact aspects of our human physiology that change in relationship, such as hormones like cortisol. But we know that we will adapt and that humans and environments will evolve together. Video credit: Example visualization of human carbon dioxide emissions. Courtesy of Dr. Poppy Crum and Nathan Swedlow. Dr. Poppy Crum believes in the power of technology to positively shape our collective future. She is a multi-dimensional expert of science – a champion for partnering with technology to enhance and elevate society. She serves as the Chief Scientist at Dolby Laboratories and an Adjunct Professor at Stanford University.